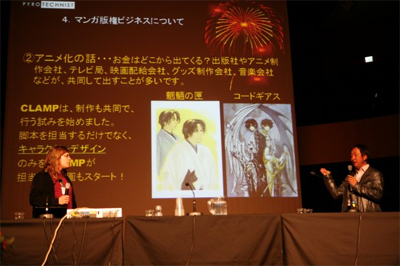 hiro_bnk has let me know that the Desucon website has put up a picture gallery including 12 pictures from Kiyokazu Fujimoto’s lecture from June 6. You can check the pictures here. Make sure to click on the pictures to see them in high resolution. Really interesting! I loved his slideshow, it looks so neat! Is that a Legal Drug pic I spotted near the start? Eh? Legal Drug? Maybe you mean the Mouryou no Hako pic in the photo from my post? LOL a such a noob mistake xD I see Lelouch and Suzaku! Though the eyes and mouth have some similarities, but the nose, definitely not.